Jim Howard defined the art of fashion illustration during the ‘70s, ‘80s and ‘90s. His highly admired work graced the advertising campaigns of America’s top department stores, cosmetic companies and advertising agencies. 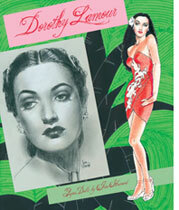 Instantly recognizable, Jim’s style was realistic and yet totally expressionistic, too. Deep, dramatic shadows, meticulous rendering of fabrics, plus an amazing blend of freestyle sketching and careful attention to details made every one of his illustrations into a memorable piece of art. Jim Howard’s career trajectory was a steady, sure-fire rise to the pinnacle of glamour but it began far from the fast lane when he was born in Sterley, now a ghost town in the Texas panhandle. He immodestly jokes that he was “the best coloring book artist in West Texas.” Jim’s first formal training was at a junior college and then he earned a Bachelor of Fine Arts degree at the University of Texas. Goodfriends, a store in Austin, was Jim’s first job. He dressed windows and drew the ads but that was cut short by a two-year stint in the Army. He returned to Texas and took his portfolio to Neiman Marcus in Dallas, one of the world’s most prestigious stores, where he remained for four years. Next step up the ladder meant a move to New York City where Jim’s list of freelance clients reads like a Who’s Who of fashion retailers: Bonwit Teller, B. Altman, Marshall Field’s, Garfinkel’s, I. Magnin, Dillards, Bon Marche and others. It was when he was hired by Bonwit Teller in 1976 that his now-famous, dramatically lighted style really locked-in. “I had done a small painting with lower, footlight-type lighting...I did a sample drawing...the first ad was a bow to the dawning space age world and the more traditional, great symbol in the New York Harbor, the Statue of Liberty.” Jim then moved on to work for Bullock’s in Los Angeles for ten years. After leaving the illustration world, Jim moved to Santa Fe where he painted and showed in a few galleries. Next, it was on to Albuquerque where he became active in the theatrical scene, acting as well as designing sets and costumes and from there, to his present home in Denver. Jim Howard’s work, fine art and commercial illustrations, has garnered many awards and been exhibited in museums and galleries from New York to Chicago, from Texas to Taos. More than three dozen of his pieces are in the permanent collection of the Boston's Museum of Fine Arts. In November 2010, Jim returned to New York City for a book signing with Patrick McDonald, hosted by the prestigious Bergdorf Goodman department store to celebrate the release of the Four Famous Dandies paper doll book. 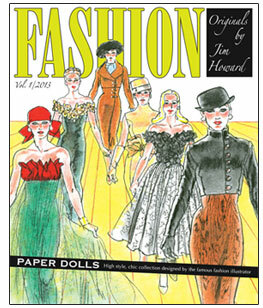 His current titles for Paper Studio Press include: Jim Howard's Fashion Ilustration Paper Dolls, Bette Davis, Ida Lupino, Dorothy Lamour, Shirley Jones, Four Famous Dandies, Gene Fashion Doll, COUTURE: Sublime Fashions of the 1950s, COUTURE: Alluring Feminine Fashions of the 1930s, COUTURE: The Many Faces Of The 1920s, Fashion Originals by Jim Howard, Vol 1.